Blackpool Signs and Graphics Ltd.
A local American car enthusiast contacted us recently about his restoration project of a classic Pontiac Firebird Trans-Am 6.6 litre. With this beast being from the early 1970's, the distinctive graphics kits are no longer available and had to be re-created from scratch. We and the client did spot some cheap-looking kits on the internet, but none seemed to be of sufficient quality or fit-for-purpose. Prior to the car's re-spray at a local bodyshop, we photographed, colour-tested and measured all the existing graphics and decals. Then onto the artwork, as our skilled illustrators painstakingly redrew every element of the original graphics. The self-adhesive vinyl material selected was our high quality cast film. The graphics were printed at high resolution, laminated with a matching cast clear film, then contour cut on our wide-format plotter. The resprayed vehicle arrived at the studio and once undercover it was thoroughly degreased and cleaned. The vinyl graphics were expertly applied over the course of the day - to complete the restoration of this classic vehicle. Whether you need small one-off printed banners or multiple large banners for a big campaign or promotion, these guidelines will help you to make the right purchase. PVC Banners – These are the most common types of banners. Typically the material will have a weight of 400gsm and above and be washable, tear-resistant and weatherproof – suitable for both indoor and outdoor applications. PVC banners will be hemmed for strength and either eyeletted or looped (pocketed) to aid installation. Fabric Banners – Most often used indoors, polyester-canvas materials have the advantage of being more eco-friendly and softer to the touch. Fabrics have to be stitched rather than welded or glued. Banners can be produced at any size to suit. The biggest banner in one piece is 5 metres x 50 metres. Bigger banners are made up of sections which can be welded together in our finishing room ready for dispatch, or supplied in up to 5 metre wide drops for you to connect together on site using ties, double-sided tape or industrial velcro. Most PVC banners are now digitally printed using eco-solvent or UV inks. Older printing machines have a low print resolution of 360dpi or less and do not print areas of solid colour very well. Modern machines, such as those at Blackpool Signs & Graphics, print at up to 1440dpi and offer ultra-sharp text, consistent solids and photographic quality images. A high quality of finish is vital to the longevity of your banners. Cheaper banners available online are generally not hemmed, they are flat cut to size and then cheaply grommeted or eyeletted with flimsy components. These can be fine for indoor or very short-term outdoor use, but do not expect them to stand up to rough handling or the standard British weather. At Blackpool Signs & Graphics we provide a high quality graphic design service for banners, although you can of course provide your own to our specifications. If you would like us to produce your artwork we need a brief from you, along with any logos or images you require on your banner, from there we will provide a quotation – typically from just £20.00 plus VAT. If you are able to supply your own print-ready artwork, individual PVC banners are available from Blackpool Signs & Graphics from £16.50 per square metre (plus VAT), including printing at high resolution on quality PVC banner material and fully hemmed and finished. Heavy Duty, Backlit and Fabric banners are a little more, but still the most competitively priced in the area. 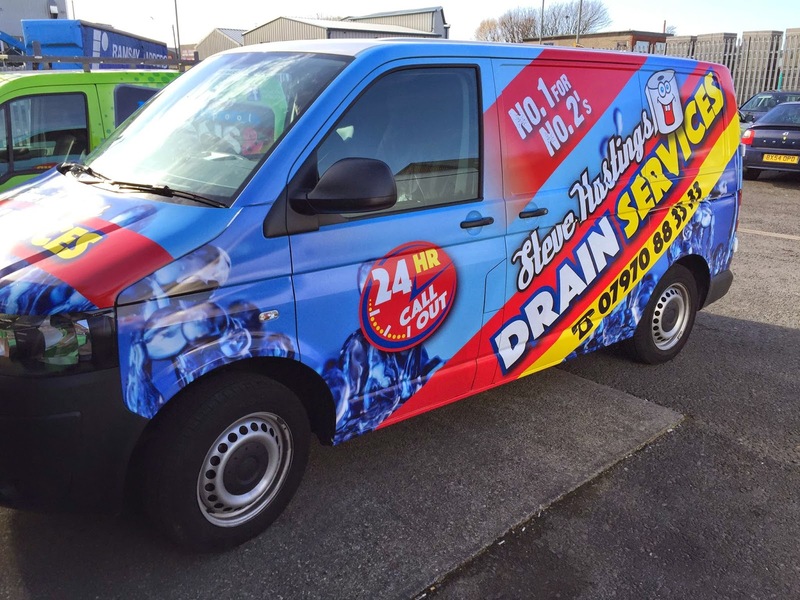 Local business owner Steve Hastings came to us with a challenge - "Here's my new van - make it the best looking Drain Services van in the industry." That's exactly the sort of challenge we like. 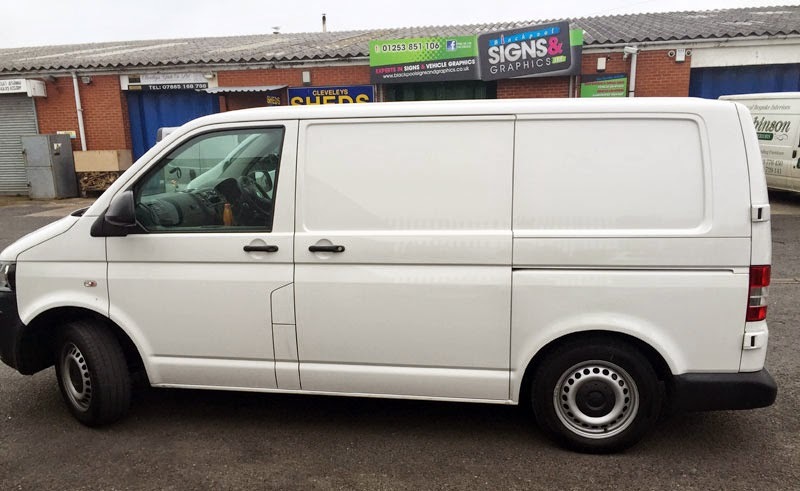 After measuring and photographing Steve's VW Transporter, our expert in-house graphic designer John Leatherbarrow got to work on his new Mac to come up with something to suit. Steve already had a catchy strapline for the business - "No. 1 For No. 2's" -, this was going to be used as a feature on the design. 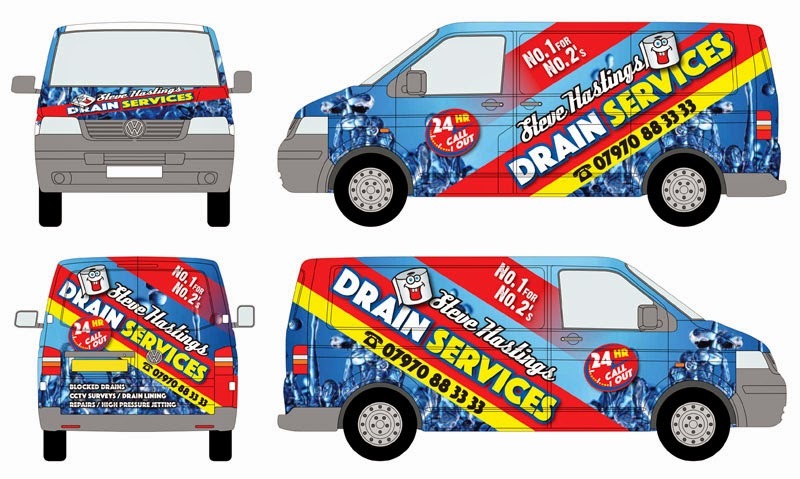 With over 15 years professional experience in stunning vehicle graphic design, John was sure to come up with something spectacular. He didn't disappoint. 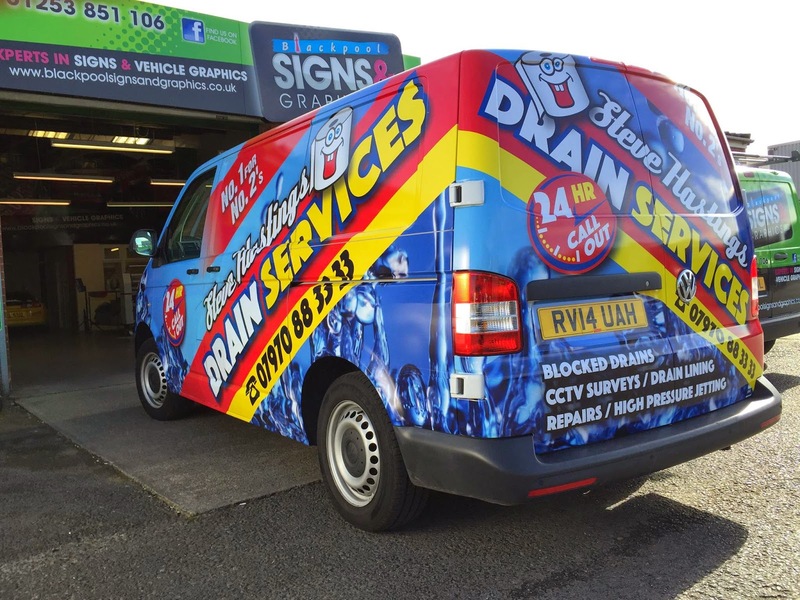 The material we print on for full vehicle wraps is a specialist premium vehicle wrap film. Very flexible, it can be almost moulded around complex shapes, crevices and corners whilst retaining performance specifications. There are cheaper films on the market but in our experience they do not offer the same combination of print quality, ease-of-fitting and most importantly, performance on the vehicle. Once printed using UV stable inks, the wrap is left to 'cure' for 48 hours. Again, this is a crucial stage. Skipping this step can lead to reduced vinyl performance and even de-lamination weeks or months later. We then laminate the printed vinyl with a matching high performance clear vinyl. This offers scratch and scuff resistance as well as additional anti-fade UV protection. Prior to a full wrap installation, vehicle preparation is absolutely key. We have noticed that this is something often rushed by other sign companies - resulting in a poorly fitted job. Prior to a full clean, all external trim has to be removed. Door handles, number plates, light fittings, door trims etc. all are removed. Only by doing this can the vinyl wrap material be correctly positioned and guaranteed to stay in place. Not removing all trims leaves exposed edges on the fitted wrap which in time may lift and look untidy. Some vehicle trims can be quite difficult to remove and require special tools. Fortunately, we can always call upon the expertise of a neighbouring car body specialist on the odd occasion we come up against anything particularly tricky. A thorough cleaning and degreasing is the next vital step. Vehicle polishes and cleaners may make you car or van shine, but they are none too friendly towards the proper adhesion of vinyl graphics. All exposed surfaces are thoroughly treated, especially the insides of doors where the vinyl will be wrapped around. 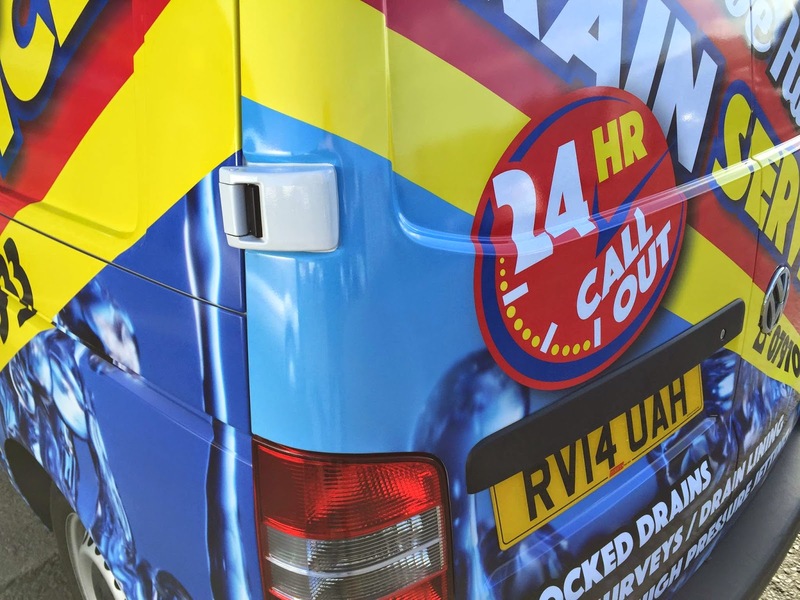 Armed with squeegees, hot-air guns, elbow grease and years of experience, our fitters generally pause for a cuppa, perform another visual check of the vehicle and then begin their craft. Local wrap jobs are performed inside our workshop as a dust-free, temperature-controlled environment is crucial. A touch thermometer is used to check the temperature of the vehicle bodywork before application - if this is within a certain range, we are good to go. On extreme days, fans or heaters are used to adjust it. After a thorough inspection of the installed wrap, the vehicle's trims are replaced back to how they were. Steve was extremely happy with the finished job. Heads are turning everywhere he drives. He has since booked the vehicle back in to have the roof done!